Natural parks are a rare being in Malta. That’s why, as someone who loves the outdoors and nature photography, I have to confess a certain bias when it comes to Mellieha, conditioned perhaps by the fact that I own a second home in the village. My love affair with Mellieha stems primarily not from its proximity to the sea and its choice of sandy beaches, but due to the varied natural environments with which it is blessed: environments which have even gained international recognition through the inclusion of this area in the EU’s EDEN network of European Destinations of Excellence. Abandoned but not forgotten: a Girna once used by farmers now preserved in Malta's Nature Park. In spite of its relatively small size, the territory covered by Mellieha features a wealth of natural diversity. The area contains no less than three of the ridges which characterise northern Malta: Bajda Ridge (from Xemxija to Ghajn Tuffieha), Mellieha Ridge (from St. Paul’s Islands to PopeyeVillage) and Marfa Ridge (From L-Ahrax to Cirkewwa). Between these ridges one finds fertile valleys such as the Mizieb Valley, the Imgiebah Valley and other small ones such as Cirkewwa’s Musa Valley with their chequered fields and small holdings. On the coast, one witnesses cliffs, clay slopes, rocky foreshores and sandy beaches ranging from the one kilometer wide Mellieha bay to smaller beaches such as Armier, Paradise Bay and Imgiebah Bay to mention but a few. There are also vast stretches of garigue over-run with fragrant wild-thyme and other species (from which the delicious Saghtar Honey comes), stretches of woodland old and new including Mizieb, Ahrax and the newly planted Foresta 2000 in Qammieh. Mellieha also sports its own wetland: the rare fresh water lake habitat housing the Birdlife Nature Reserve and giving the name to the area around Mellieha Bay, L-Ghadira which literally means “the lake”. In short, a diverse landscape within a small place which is around twice the area of Comino. One of the latest achievements in Mellieha’s long list of environmental jewels is the designation of a huge swath of land extending from Manikata and Ghajn Tuffieha to Anchor Bay on north-west coast of the island into a protected area which has been baptized the Park tal-Majjistral or the North West Park; Malta’s first national park. 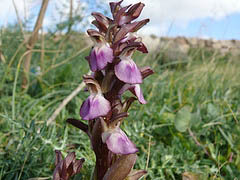 Formerly earmarked for a range of different development options including luxury accommodation and a first class golf course, the Park was born out of the Authorities’ recognition of the increased level of public awareness in favour of protecting what’s left of Malta’s highly shrinking countryside. One of the worst things you can do when you have the luxury of exploring Malta without the constraints of a brief visit is the “do” the place by car. Already small as it is, the island becomes reduced to a forty-minute-drive when viewed in its totality. Within this definition, il-Park tal-Majjistral is reduced to a seven-minute drive: hardly Yellowstone! So what is the fuss all about, you may ask? My answer is that a park like il-Majjistral is not the sort of place you drive through: it is meant to be enjoyed on foot. Scaling down from four wheels to biped immediately extends the scale of the park from minutes to hours of exploration. And this is definitely the way to enjoy it. As it currently stands, Park tal-Majjistral is still a raw jewel. Within its boundaries one finds the widest range of scenery ranging from pristine landscapes to mounds of building rubble; from lovingly kept fields to numerous trappers’ hides scarring the landscape. Unkempt paths lead to crumbling military architecture and the ubiquitous RTO sign scrawled on walls is a grim reminder of the hunting activity that takes place both legally and illegally within its borders. In terms of its major attractions, I would list the dramatic coastal scenery including the beautiful, deep, blue Mediterranean, the fantastic sunsets, the views of Gozo’s majestic Ta’ Cenc cliffs, the rich flora and the sense of timelessness that the place possesses. Walk there on a crisp winter’s day with nothing but the wind whistling through your ears, seeing the waves pounding the broken coast and the sensation is exhilarating. Go there on a summer’s evening and wonder at life’s tenacity on a dry, sun-burnt landscape. Enjoy the nature by focusing on the small and the minute. This week alone I managed to source two of the earliest flowering orchid species within the park: the fan-lipped orchid and the conical orchid. This while passing through patches carpeted with cape sorrel, crown daisies, borage, asphodel and spurge among many others. A truly rewarding experience. The Park is under the collective administration of three NGOs, namely Din L-Art Helwa, Nature Trust and the Gaia Foundation. Plans are in the making for the clean-up and maintenance of the site and the introduction of sustainable forms of human activity including educational, leisure-related and agricultural. Given the credentials of the NGOs concerned, I have no doubt that they will do an excellent job. In a strange sort of way, however, I long for this area to remain as it is: unknown and undiscovered except by the happy few who are aware of its charms and wonders. I hope that it will not become too popular and accessible, and I also hope that the signs of modern human activity will not become too overwhelming. Let us remove the dumping, let us restore the heritage and let us maintain and restore the paths. But let us not install lighting, or picnic tables and signposting to point to the obvious. Let us retain a small corner of this island of ours where one can stand and stare and lose track of time. Let us do this in il-Majjistral. Il-Majjistral Nature & History Park website has details of where to walk, fauna and flora, events and more. For more stunning views of Il-Majjistral, see Leslie Vella’s photos on Flickr.